During its 62nd Annual Conference and Tradeshow in Atlanta on Sept. 8, the International Downtown Association recognized Capitalize Albany Corporation and the Impact Downtown Albany strategic plan, awarding the 2016 Downtown Achievement Award of Excellence. View the submitted presentation here. The Award of Excellence is a new category that acknowledges innovative best practice entries which were uniquely strong. The market-driven, action-oriented strategic plan was among five qualified entries in the category of Planning. This category recognizes planning efforts that establish a strategic position for downtown with elements of the plan having already been approved, ratified, or implemented. 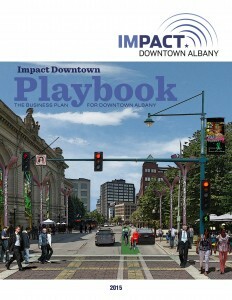 The Impact Downtown Albany strategic plan’s Playbook can be found at www.capitalizealbany.com/impact-downtown. Its results-driven implementation is currently acting as a guide for local redevelopment and reinvestment in a manner that meets the needs of residents, businesses and other stakeholders. Transformation and activity is already taking place in downtown Albany attributable to and supported by the strategic plan. Key partners are beginning to grow and diversify downtown’s economy through a focus on residential conversion of obsolete office space. Downtown Albany has become the City of Albany’s newest neighborhood with more than 300 new residential units that have come online in recent years. Downtown’s residential capacity can absorb 100-200 additional units annually over the next ten years, and the district is on track to meet that market potential. Owners are reporting an occupancy rate of 97 percent. The new population is fueling downtown’s retail market growth and for the first time since 2009, the office vacancy rate in downtown Albany fell below the 20 percent threshold.